Kiltale’s Cathal Brien finished in 3rd position in the Leinster U16 long puck competition held in Carlow on Thursday night at the St. Mullins Club. Cathal finished 3rd of the 12 Leinster counties and finished 2 shots behind the winner he had 60 shots to complete the course and the winner had 58 shots. Kiltale got their intermediate campaign back on track after a 5 point victory over a fancied Dunboyne team. Kiltale lost their first two rounds to Kilmessan and Kells and this was a must win game to keep their hopes alive. 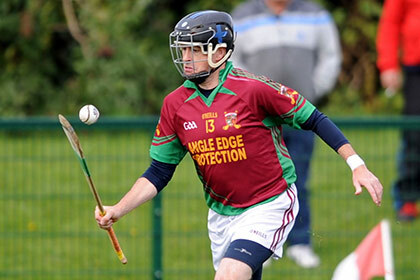 P.J.Walsh (pictured) a major stalwarth for Kiltale for many years proved to be the difference with a personal tally of 2g 7pts and he showed great leadership for all the younger players around him. The Kiltale defence were very uncompromising and Dunboyne found it very difficult to get scores and Sean Carrol,David Kane and T.J Lynch played brilliantly in the full back line and the half back line of Brian Reilly,Stephen Cummins and Johnny Carey gave a constant supply of the ball to the Kiltale forward line. David Schilder and Mark Mc Cormack were on top at midfield and mc cormack hit a great early point from out on right. In the forwards Stephen White and Anthony Farrelly hit two great points and county minor footballer Kevin Ryan was a constant threat to the Dunboyne defence and he hit two great points and got fouled on 3 further occassions and P.J.Walsh converted the resulting frees. Man of match P.J Walsh scored two great goals the second he soloed in from the half forward line and tapped the ball over the advancing Dunboyne goalie. SUBS:Alan Donnelly for Clear, Shane Browne for Farrelly, Anthony Brien for Kane injured..
Scorers – PJ Welsh 1-2,T Mahady 0-2, D Dixon 0-1, W Harnan 0-1. Alan Donnelly, T Mahady; B Reilly, D Dixon, S Ryan; M Hennessy, PJ Welsh, C Garvey. Subs – Anthony Donnelly for S Moyles, W Harnan for C Garvey, E Patterson for M Hennessy, S Cummins for S Ryan.